One of my favorite web site is Hacker News. Hacker News is the probably the best community for the people who want to experiment with new technologies and make their own online businesses. I decided to make mobile version for HN only for the front page news, mainly for the people who want to fast check front page news without consuming much bandwidth. I basically striped everything leaving just the titles and the link pointing to the comments. If you don’t know what JSONP is here is my tutorial. YQL is very cool technology here is one useful resource also see Christian Heilmann site . For now YQL is safe from being unplugging and I hope will it not have the same destiny like Yahoo BOSS. But the main motivation behind this project wasn’t saving bandwidth but having clean essential page(yes, even more essential then now). I had trouble finding the story link among different links even I had clicked few seconds before on the link. So If you like it use it. Did I mention that is compatible iPhone, iPad web app. Just tap to + bookmark button Add to Home Screen. It should also be compatible with Android. I’m not sure if the title of this project should be called CSS Reset or CSS Set or CSS Mobile Base. The goal is to provide default CSS for mobile devices. Few years ago I build Hartija CSS Print Framework, the great thing about Hartija is that you have very fast print ready page. The same thing I want to achieve with the Mobile Reset to have content ready fast solution. Internet connection for mobile phones are still expensive and slow so smaller CSS file will provide faster download and better user experience. All the browser implement CSS reset by default. I don’t think that is always smart to reset the reset. If you building complete CSS Framework is OK to reset everything but in many cases it is better to reset just the main HTML elements or the critical HTML elements. 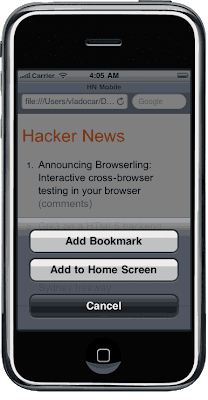 After resetting some elements it would be nice to set some HTML elements optimized for mobile phones. We want to images not to be bigger than the mobile screen or if one word is bigger than the screen the word should brake. Have you tried reading from mobile phone without zooming? I suggest to start with bigger font size. I implement 16px default font size. Feel free to change it. I also picked Arial like default font. Sans-serif can work well in some older low resolution mobiles. You can use CSS Mobile Reset with combination of Bulletproof CSS3 media queries. Any suggestions how CSS Reset can be improved? JSON works well with XmlHttpRequest (AJAJ/AJAX) but the main problem with XmlHttpRequest that is limited with same-domain browser policy. Meaning that you can’t use JSON for remote requests. For that we have JSONP or "JSON with padding" or remote JSON. JSONP is a "hack" of JSON in order to make remote request from different domain servers. In this format(JSONP) can be injected like Script Tag Injection. In order to parse AnyNameYouLike JSONP we have to have function named AnyNameYouLike. Meaning that the function name should match with the callback parameter. It is important to remember that JSONP is not AJAX and doesn’t use XmlHttpRequest but the script tag. JSONP is faster than JSON. Because JSONP is actually hack to bypass browser security issues is considered not safe. In the future will probably have something like Cross-Origin Resource Sharing (CORS) that hopefully will provide more safety. Let’s build some practical example. We will use Yahoo YQL to parse reddit.com RSS. YQL will help us to convert RSS to JSONP. The working Demo. Look at the code.